I’ve written a few zines, all available in the merch section of my website. 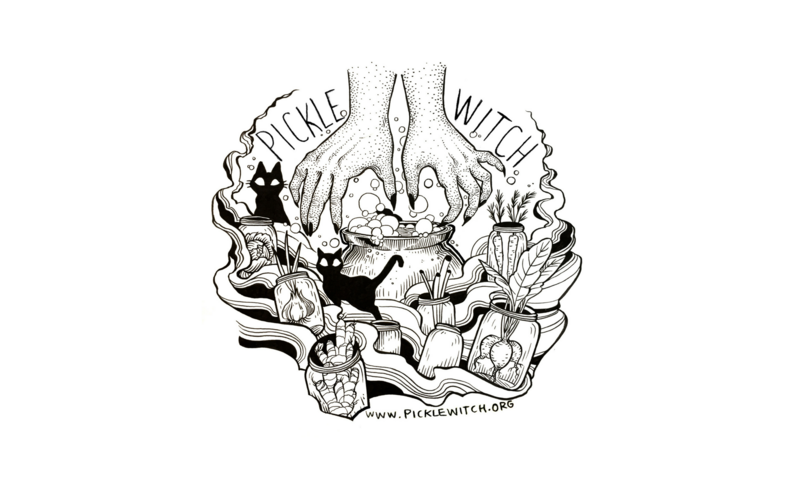 Pickle Witch #1 is about being a pickle witch, with some content on cultural appropriation. 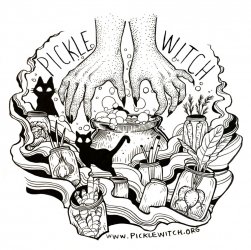 Pickle Witch #2 is a little darker, with some pickle content, an unrequited queer love story, and some content on death. Salt is a mini zine about the magic of salt. Bean Zine is about the science of bean farts, including a fermented bean recipe. I think it’s time to work on my next zine project! Cultural appropriation is a hot topic, for a reason. Cultural appropriation is easy to feel and know if you are culturally connected to food that’s been stolen and monetized in ways that don’t benefit you. It feels nebulous if you’re used to consuming other cultures. I thought about making this zine about “Cultural Appropriation,” but that feels like approaching my relationship to food and culture from a deficit perspective. Why should we only talk about theft? Appropriation is definitely a piece of the puzzle, but there’s so much more to food culture. I’m looking for BIPOC/QT contributors to my next lil zine. 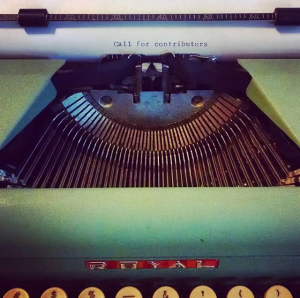 I am looking for poem, prose, personal narrative, hot takes, art, playlists, book review, whatever I can fit into my zine. I’m happy to take original work or work you’ve previously published. I am also looking for content (QT/BIPOC intersection required) for the “resources” section which I include in every zine, because zines are gateways to diving deep into subjects! I can trade you a jar of pickles worth $24 (local only), or I can pay you $20 cash for original content! $16 pickles or $10 for content you’ve published elsewhere that doesn’t need any reworking or editing. Or something else? I’m always open to figuring out compensation that makes us both feel good. And of course you’ll get a finished zine mailed to you! The pages will be 1/4 letter sheet, 4.25″ wide by 5.5″ high. I have them printed on a professional laser printer, with a thick weight cover and high quality printer text block, they are fastened with staples. Black and white only. They cost about $2 to make, and I sell them sliding scale $4-$6. Optional: your name, pronouns, ten word bio, and any links or contact info you want for your byline. High contrast is awesome, any kind of decent sized image file is great. I don’t do any image editing, unless I have to make sure it looks okay in black and white if you submit a color image. 200 words/1100 characters fit on one page, 400-450 words/2500 characters fit on two pages. Mostly I’m looking for pieces that are 450 words/2500 characters, but I am very open to talking if you have something shorter/longer. The Pickle Factory will be closed 8/12-8/22. This means I won’t be able to email you back or have any pickups scheduled during that time. But never fear! I have plenty of sales during that time for you to get your pickle fix! Reminder that I am a CASH ONLY small business. Save money and the planet by bringing me clean glass canning jars (please no dirty pb jars). Thank you for supporting small, local businesses. Supporting workers striking against Amazon is really important, AND feeding cash money into networks of small, hardworking artists and makers in your local community is next level. The more we buy locally the better our quality of living, because big corporations can’t get a foothold in our markets. I know not everyone has the cash to spend, so please support us in other ways like sharing our events and inviting your friends! Everything counts!! Please join Pickle Witch for a Salad Walk! 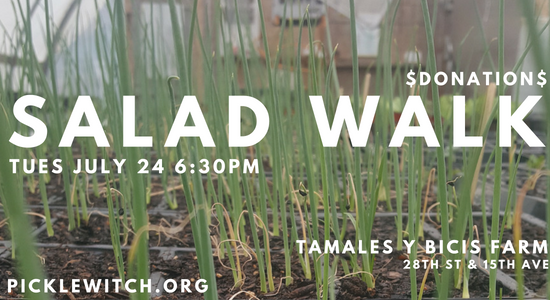 We will meet at 6pm at Tamales y Bicicletas Farm. Have a nibble, take a sip, and enjoy this urban farm. At 6:30 we will gather to talk about foraging, and then we will walk around the farm to fill our bowls with wild foods. We will be done by 7:30, but I encourage you to hang out and eat and socialize until the bugs come out around 9. Pickle Witch pickles and shirts will be for sale at this event. 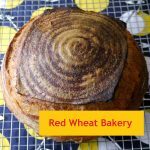 Can tap water be de-cholorinated for fermentation? I have been told over and over again that you have to let your water sit out on the counter for 24 hours before using it for fermentation, because of concerns about chlorine in the water killing off beneficial bacteria. I was curious about this method, which comes from the idea that chlorine is a gas and will evaporate over time. Water is life. This means we don’t want crude oil pipelines running through sacred land. All land is sacred in some way, and those pipelines leak and burst and contaminate groundwater forever. No amount of Dawn can clean the earth after massive pipeline failures. Entire biomes die. Building pipelines disregards sovereign tribal lands and the health of our environment. Flint, Michigan, after four years, still does not have clean, lead-free water. One of the basic responsibilities of a municipality is to provide clean water to its residents. This crisis was caused by a scheme to cut costs, incompetence, and a cover up that has lead to widespread illness and deaths. The city recently stopped giving residents free bottled water to mitigate this disaster, further disenfranchising low income people. In Minneapolis, we get all of our drinking water from the Mississippi River. Agriculture, industry, and urban runoff all drain into our River. 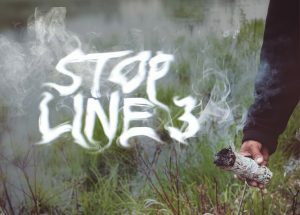 When we throw down cigarette butts, don’t pick up our dog waste, don’t gather our leaves, fertilize our lawns with pollinator-killing pesticides… It all goes into the river we drink from and the lakes we swim in. Water quality is much worse for people in New Orleans and further down the Mississippi. 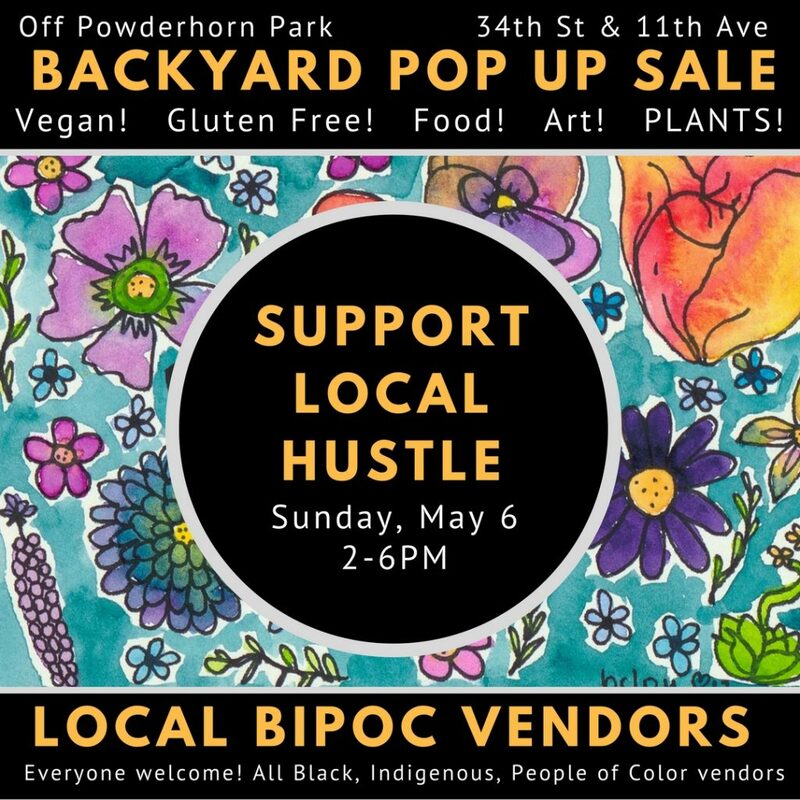 Our next Support Local Hustle: BIPOC pop up will feature visual art, pastries, pickles, and a plant sale! It will be held near Powderhorn Park. Backyard near the SW corner of Powderhorn Park, 34th 1/2 St & 11th Ave S– Follow the signs! This event is free, cash only, and open to all folks who would like to contribute to a respectful space explicitly against sexism, transphobia, and racism. 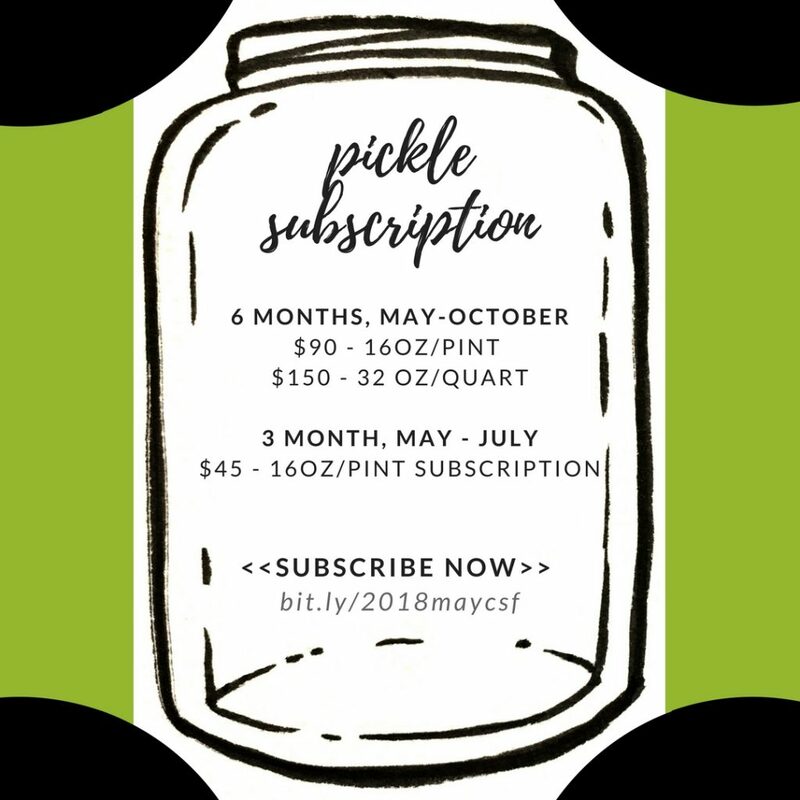 Join the Pickle Witch CSF to get a jar of ferments every month! Since the 80s people have been supporting the local organic food movement through Community Supported Agriculture (CSA). By buying “shares” of a farmer’s produce before their crops go in the ground, consumers guarantee the farmers have the cash to live and plant, and share in the financial risk and reward of the uncertainties (drought! bugs! the unknown!) of farming without farmers being reliant on financial institutions. Learn more about CSA. This isn’t a CSA, where you are buying shares to support a farmer and buck the industrialization of agriculture. This is a CSF! Read the end of this post for more on how this model is supporting me and people like me. This is a celebration to welcome spring, and to announce my new pickle subscription! I’m really excited to be partnering with some friends to have an afternoon of snacks and hangs in a cozy space! 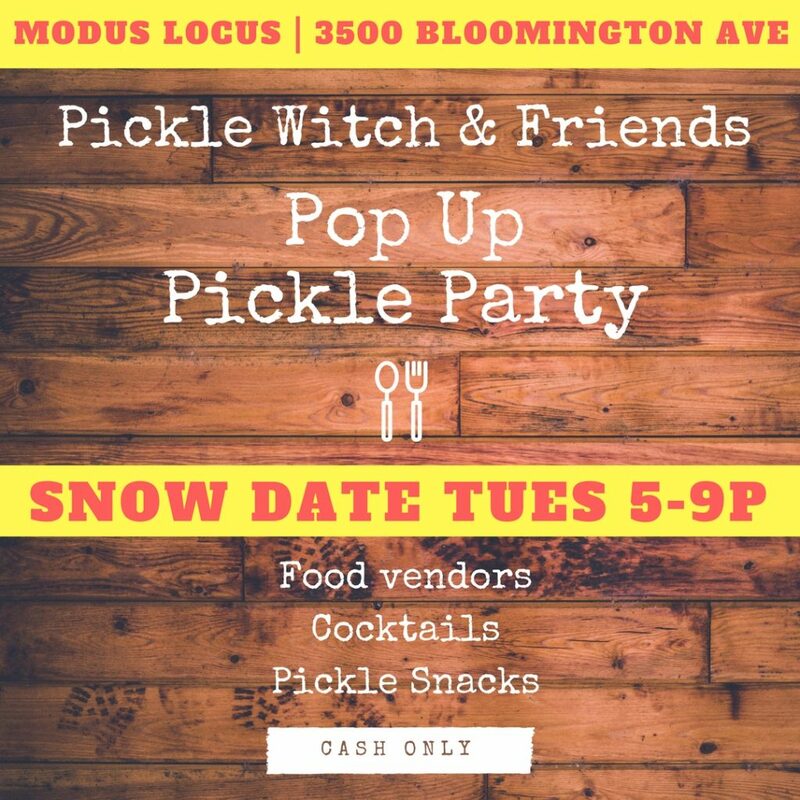 Dulceria Bakery (artisan Mexican pastries- gf/v options), Red Wheat, (breads and crackers- v options), and Pickle Witch (fermented pickles- gf/v) will be selling our wares at Modus Locus Gallery (3500 Bloomington Ave). 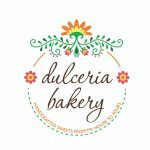 Buy things from your favorite vendors! Win prizes! Eat pickle snacks! Entrance to this event at Modus Locus is free! You don’t need a ticket/wristband to purchase from vendors. The gallery is served by bus route 14, there is plenty of bike parking available, and on-street car parking. The nearest ATM is at Sam’s Market, across the street. 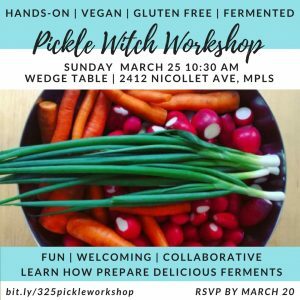 I’m hosting another hands-on pickle workshop! We are going to prep some delicious veggies for fermentation together, and make a spicy (to your individual taste) kimchi-inspired ferment. What will I come home with? What am I responsible for bringing? Who is the Pickle Witch? This is a wheelchair accessible location. 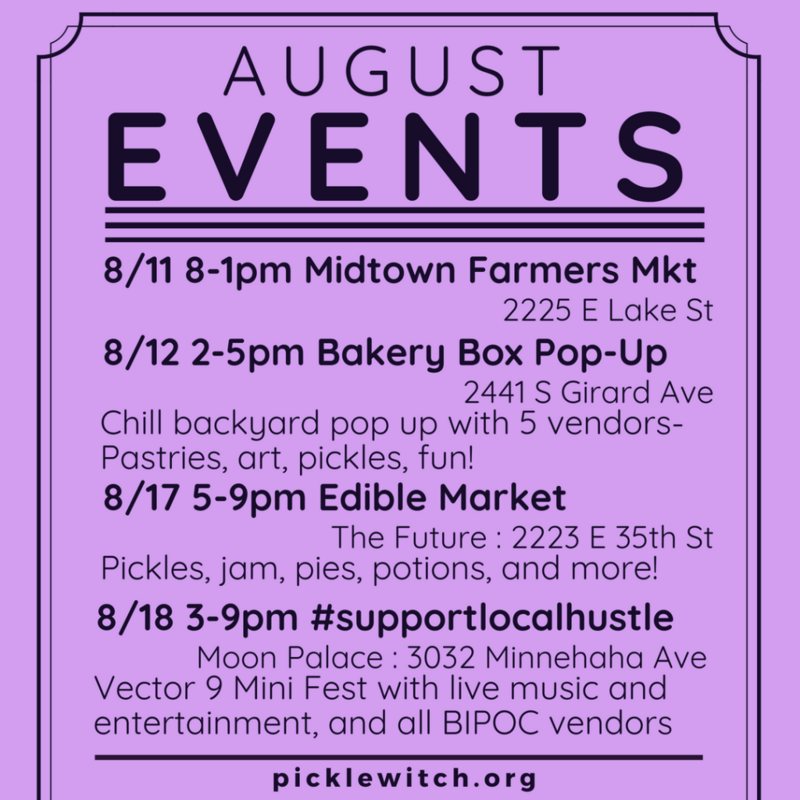 Please join us and support local BIPOC (Black, Indigenous, People of Color) artists, bakers, creatives, and makers at this warm and inviting pop up! Vendors will be selling their art, baked goods, pickles, and jewelry, among other treasures. Goods are mostly $1-$40. 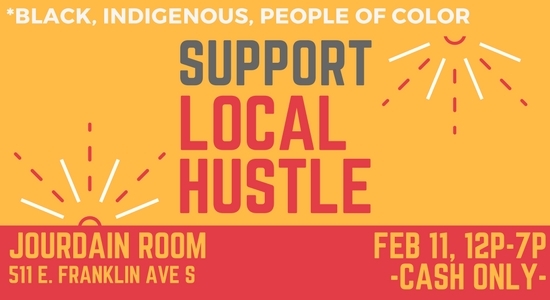 If you would like to donate at the door, we will be raising money for Cafe Southside, a local safer space for queer and trans folks in South Minneapolis.